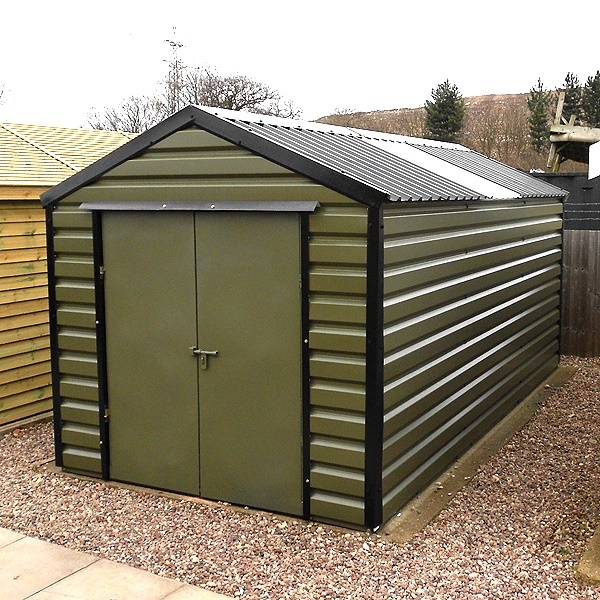 The Lifelong Apex steel shed is a stylish, robust and secure steel shed made to last with PVC coated galvanised steel cladding fitted to a rigid 40mm x 40mm box steel frame. Available in a wide range of sizes from 6ft x 7ft up to 12ft x 23ft 3in. 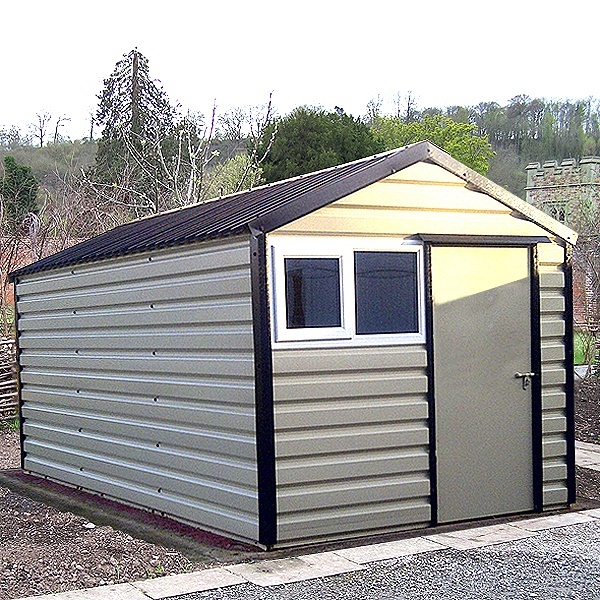 The Lifelong Apex steel shed is not to be compared to the metal sheds available in catalogues or many garden centres. These buildings are extremely strong and built to last. 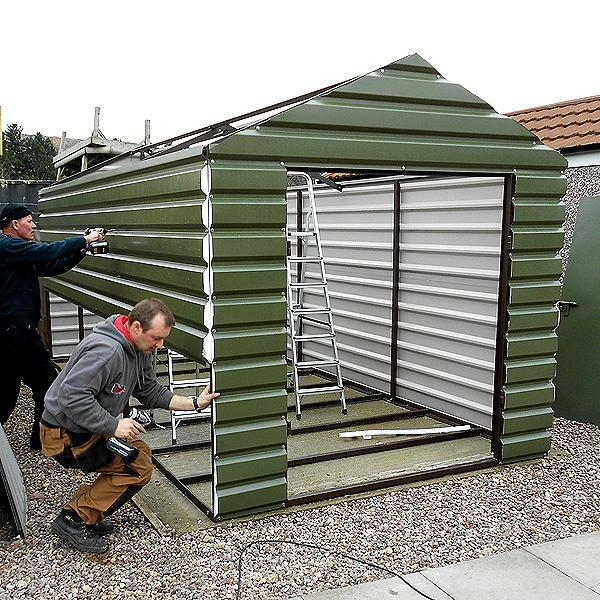 PVC coated galvanised steel cladding is fitted to a painted steel box frame, on-site, by Lifelong trained installers. We also offer this model in a pent style. Click here to view this model. Why Choose a Lifelong Apex Steel Shed? Strong steel cladding fitted to a rigid 40mm x 40mm box steel frame available in 5 attractive colours. A strong steel single door fitted within the box framework meaning the door cannot be lifted off it's hinges. The sliding bolt lock is fitted onto the main door for additional security, ready for you to fit a padlock of your choice. A white, opening, double glazed window is included as standard and fitted to the front of the shed in a position of your choice. Included is a 18mm OSB timber floor. No painting, treating or worrying when garden shrubs start to grow up the building. While we would still recommend a base, the Lifelong Shed can sit on the ground providing this is reasonably level and clear of obstruction. The roof cladding is treated with an anti-condensation membrane to prevent dripping in cold conditions. No extra charge is required for delivery and installation and your shed can be delivered and erected in one visit by our professional team in 2 to 3 hours. Protect your padlock with a padlock protector for increased security. Upgrade your bolt lock to a deadbolt lock with key. Upgrade your standard single door to an extra wide door. Upgrade your standard single door to a 5ft wide double door. Please note: upgrading to double doors will remove the window. Move your standard door and window to the side of your building instead of the gable end. Upgrade your window colour from white to black. Move your window or add additional windows to customise your building and add extra natural light. Make your building even more secure by adding metal bars to go behind your double glazed window. If you are planning to fit electricity into your steel shed, this panel with light switch and socket will come in very handy. Add heavy duty hooks to your Lifelong building. Ideal for hanging tools and equipment. Add shelving to your shed for additional storage space. Add guttering to both sides of your shed. This is the 2.5m wide x 2.1m deep Lifelong Apex in Olive Green finish, one of four colour choices available. This one is pictured at our Wolverhampton display centre, one of over 30 GBC branches nationwide. Please use the 'where can I see one' link on this page to find out where your nearest branch displaying the Lifelong range is located. This is the 2.5m wide x 2.1m deep Lifelong Apex in Anthracite finish, one of five colour choices available. This one is pictured at our Dunfermline display centre, one of over 35 GBC branches nationwide. 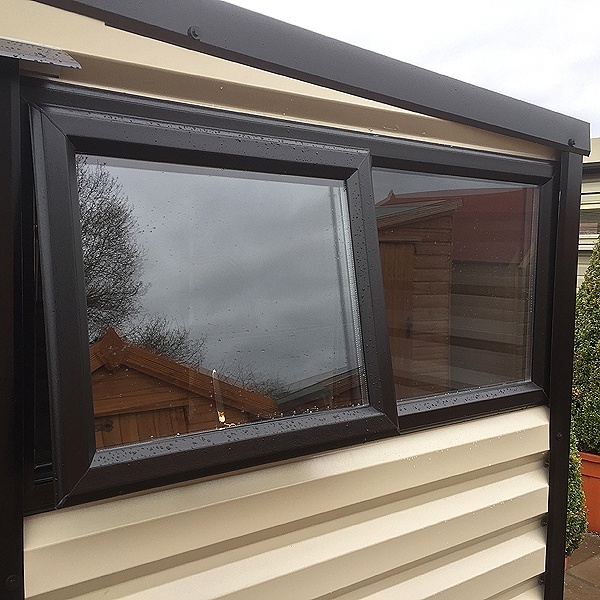 It also features our black uPVC window option. 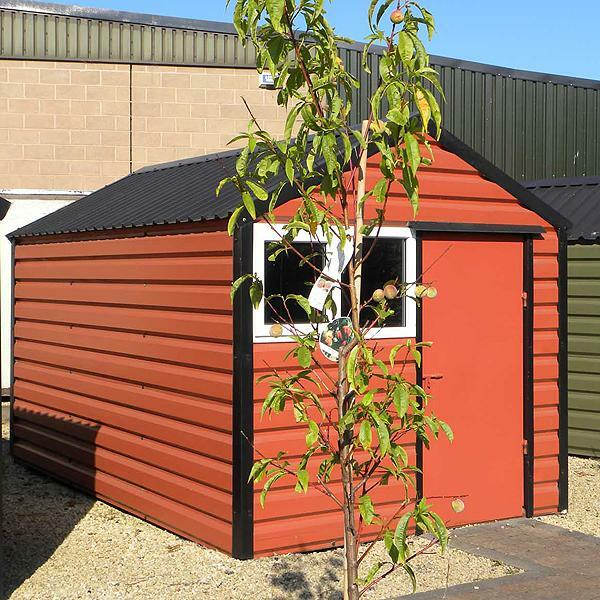 Without doubt the most popular size in our range of Lifelong sheds, this building is 2.5 metres wide and 3.1m deep. The door and window can be interchanged to suit your location or we can leave windows out entirely if you prefer for additional security. On-site installation by the manufacturer's fully trained fitting teams, onto your prepared base, is included throughout most of the UK. Set outside this factory unit this building provides additional secure storage. The terracotta colour isn't everyone's cup of tea but it is a great choice for schools and playgroups to cheer up the scene ! This is a roomy building, very secure and sturdily built with maintenance free PVC coated steel cladding in olive green finish. It's on display at our Coleshill branch, one of a selection of our sites which have demonstration models of these exceptionally strong buildings. In order to find out where you can examine the quality of construction just click on the 'where can I see one' section at the bottom of this page. There is a window on the LH side which you can't see in the picture but on this side you can see the translucent roof sheet which is a useful addition to the standard building. The double front door is also an option as single doors are supplied as standard. Lifelong sheds are built on site to exacting standards. These are definitely NOT the steel sheds you can get from catalogues or some garden centres. They utilise high quality PVC coated galvanised steel cladding which is bolted to a rigid painted 40mm x 40mm steel framework on site. 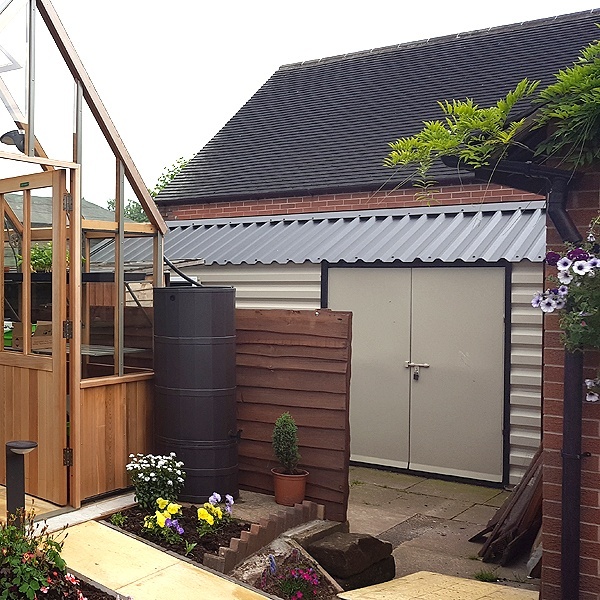 You can see some of the key features in this picture of an Apex shed installation such as the draught proof packers in the ends of the cladding and the sturdy framework. Contrast this with the flimsy steel sheds you see elsewhere which have no floor and poor quality sliding doors and you'll realise what good value for money Lifelong sheds offer. All Lifelong sheds include installation by the factory's expert fitting teams.. one of the other major benefits of buying Lifelong steel. Late evening and the tools and equipment are put away and padlocked in for the night ! Metric size is 2.5m wide x 5.1m long. You can see why our customer wanted to have the double doors in the side of this building... and Lifelong obliged ! This 16 x 8 Mushroom coloured Apex shed fits neatly into the space and provides a secure location for tools and equipment.. Most of our pictures here show a white PVC window as a standard fitting with Lifelong buildings. Shown here is the option of black PVC frames. This is the Pent version of the Lifelong shed, full details of which you will find on its own separate page ! This building is in Vandyke brown and is fitted with a black PVCu window which is optional, replacing the standard white window. This sturdy padbolt is fitted to every Lifelong building and slides into the box section steel framework so it can't be prised out to gain entry. There's a fold over hasp which means you can fit your own padlock ... but don't lose the keys as you can't lift the door off its hinges or lever it open.. it's just too strong and secure ! If you are really concerned about the security of the contents of your Lifelong building then we can fit security bars as an extra precaution. Lifelong sheds are built on site to exacting standards. These are definitely NOT the steel sheds you can get from catalogues or some garden centres. They utilise high quality PVC coated galvanised steel cladding which is bolted to a rigid painted 40mm x 40mm steel framework on site. You can see some of the key features in this picture such as the draught proof packers in the ends of the cladding and the sturdy framework. 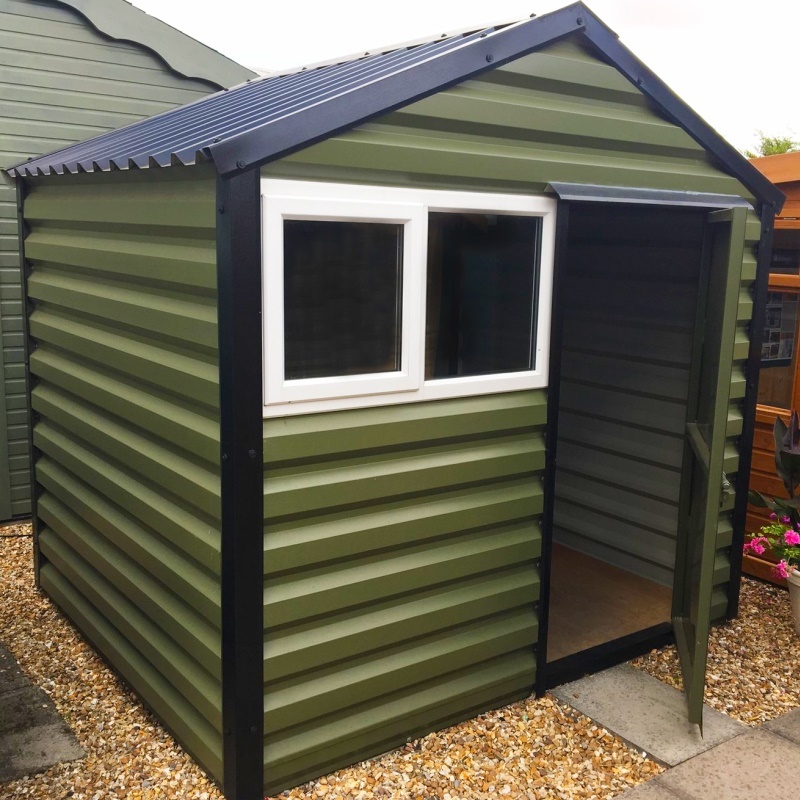 Contrast this with the flimsy steel sheds you see elsewhere which have no floor and poor quality sliding doors and you'll realise what good value for money Lifelong sheds offer. This 8ft wide Apex is perfectly suited for storage of garden machinery, bikes, as a workshop, or just for general storage. Because the doors are so strong and secure and can't be lifted or prized off their hinges, you can be sure your contents are well protected. The 18mm heavy duty OSB floor is an ideal finish and can be easily swept and maintained. You can see how much light the translucent roof sheet on the RH side is allowing into the rear of the building. 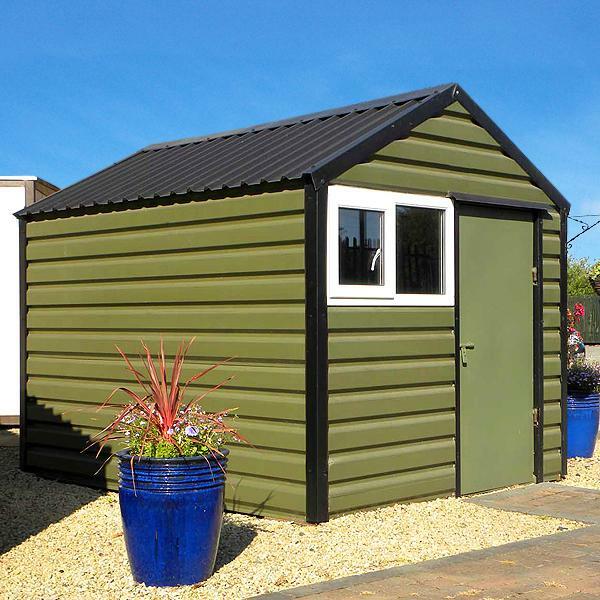 Lifelong sheds are built around a rigid, heavy duty box section steel skeleton which makes them secure, heavyweight and longlasting. Because of the nature of the floor frame construction we can install Lifelong Steel buildings onto slightly uneven surfaces with the use of packers to level the building up. This is against our usual advice for timber sheds which is to prepare an absolutely level base of slabs or concrete but with Lifelong it could save you the cost of a new base if you are installing onto an old hardstanding which has become a little uneven. The 18mm OSB flooring is screwed down to the box section steel floor frame at the end of the installation process and gives a smooth and hardwearing finish inside your building. One of five colours we offer as standard .. illustrated here is the Lifelong maintenance free PVC coated galvanised steel cladding in Brown. One of five colours we offer as standard .. illustrated here is the Lifelong maintenance free PVC coated galvanised steel cladding in Olive Green. One of five colours we offer as standard .. illustrated here is the Lifelong maintenance free PVC coated galvanised steel cladding in Terracotta. One of five colours we offer as standard .. illustrated here is the Lifelong maintenance free PVC coated galvanised steel cladding in Mushroom. 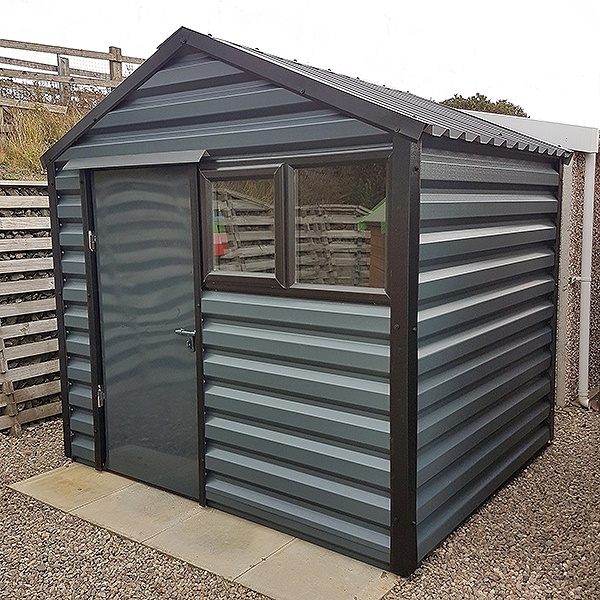 One of five colours we offer as standard .. illustrated here is the Lifelong maintenance free PVC coated galvanised steel cladding in Anthracite. Shown here from the inside you can see the white, double glazed maintenance free PVCu opening window supplied as standard with Lifelong steel buildings. Smaller models may have a single pane window. Black PVC windows are an additional cost option. For additional security you may wish to specify the building without a window and perhaps specify the optional translucent roof sheet. Lifelong doors fit into a surrounding box section steel frame so the door can't be lifted off the heavy duty hinges as pictured. Roof sheets are also PVC coated galvanised steel and are bolted in place prior to fitting the ridge capping. This shows a number of the key points about the Lifelong roof construction ... the anti-condensation coating on the roof sheets, the roof truss supplied as necessary on larger Apex models, the optional translucent roof sheet and the ridge capping. This shows how the corners are neatly finished with foam packers designed to draught proof the structure. The door is fully framed internally making it exceptionally strong. Over the door you will see a weatherguard which deflects the rainwater. Our customer didn't waste much time getting to work in this Lifelong building... but he took time out first to varnish the floor which looks great ! The picture speaks for itself with light flooding the interior of this building demonstrating the benefits of our Translucent roof sheets. This Lifelong shed has been installed onto a gravelled area rather than a conventional slab base. It's obviously important to get the building square and level to ensure that the door and windows operate properly but once the rigid steel frame has been levelled up the rest of the installation is straightforward. This building has an additional window in the side, just visible in the picture. These strong hooks are available as an additional option for hanging garden tools. The shelf and support brackets are available as an additional option. We take pride in making sure that your building will arrive in perfect condition - that is why we use our own team of drivers and fitters. As with all of our garden buildings, we like to provide our customers with a suitable delivery time. We always give good notice of our arrival date allowing you to be sure it is the right time for you. We always appreciate any helpful information regarding access to your base area, plus any details you may need to share with us about reaching you - so that the delivery process can run as smoothly as possible. Our delivery times can vary from season to season, but typically, you should expect to receive your building around 6-12 weeks from when you order. All of our buildings are made to order, so during the busy spring to summer seasons, this may increase depending on the building that you have purchased. Please feel free to contact us on 0800 999 0123 to check our current delivery times. Where Can I See Lifelong Sheds?